This Dakar Day 1 Report is brought to you by Husqvarna Motorcycles SA, Shameer Variawa Racing and Red Lined Motoring Adventures. Just when most thought the Peugeot Dakar era was over following the factory team’s exit, French rally legend Sebastien Loeb driving a privately entered 2017 3008 DKR racer, delivered a crushing performance to win Tuesday’s second stage from the squabbling pack of Nani Roma’s Mini, Bernard Ten Brinke and Giniel de Villiers’ Toyotas and the Minis of Saudi Yaseen Al Rajhi and France’s Cyril Despres. Dakar legend Stephane Peterhansel stopped for 20 minutes to repair his Mini as he dropped down the order while overnight leader Nasser Al Attiyah appeared to struggle as he lost time consistently to come home 11th behind Harry Hunt’s Peugeot, Carlos Sainz’ Mini, Peruvian Nikolas Fuchs in a Proto and Vladimir Vasiliev’s Toyota. The two wheeled battle followed the cars on Tuesday and it was all about US rider Ricky Brabec, who took charge early on aboard his Honda to and lead all the way, only for Austrian KTM rider and last year’s winner Matthias Walkner to steal a 20-second win in the last sector. Honda rider Kevin Benavides, KTM rider, Aussie Toby Price, Chile’s Pablo Quintanilla (Husqvarna) and Sam Sunderland (KTM). Barreda mow leads Walkner and Brabec overall. Botswana rookie Ross Branch impressed hugely running well in or about the top 20 on his KTM en route to 22nd for the day as he moved up from 42nd to 30th overall and second among the rookies. SA lad Kenny Gilbert kept a watching brief on his Husqvarna, climbing steadily through the field through the day to remain 40th overall, while non-assistance rider Stuart Gregory was running in 81st at the time of writing. The trucks and quads were still in the stage at the time of writing — Argentine Nicolas Cavigliasso took the opening quad stage, beating countryman Jeremías González Ferioli, while Russia’s Eduard Nikolaiev took his Kamaz to truck victory over Iveco trio Dutch driver Ton van Genugten, Argentine Federico Villagra and another Dutchman, Gerard du Rooy. 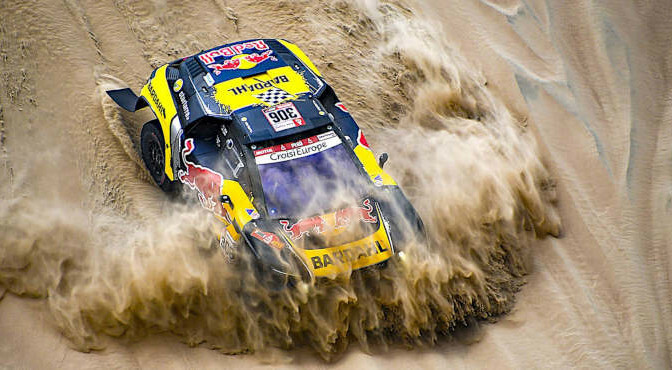 Wednesday’s third day of Dakar 2019 will see competitors racing 331km of the 799km run through the arid wastes between San Juan de Marcona and Arequipa including an ominous dune called Acari that will be included for the first time.